Finally, another way in which we work on categories is to see how many items a person can list in a given category. With some students, I use basic categories and with others I get more specific. 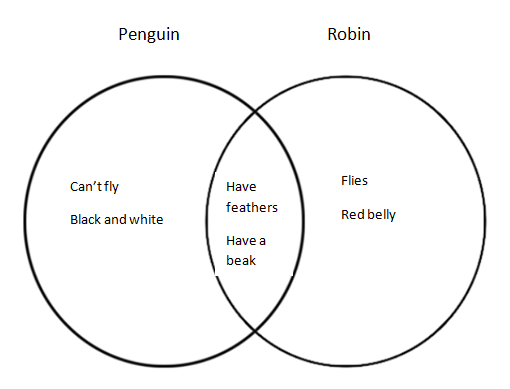 For example, basic categories include shapes, animals, plants, foods, letters, etc. More advanced categories may include names of African animals found in a zoo or fun things to do in New York. 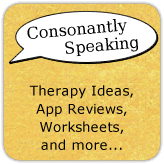 Continue reading for some ideas of how to work on categories in speech-language therapy, DIY category tools, and cool therapy products related to categorization skills! If you have read some of my previous posts, you may have seen my post about using a serving tray with sections for categorization skills. 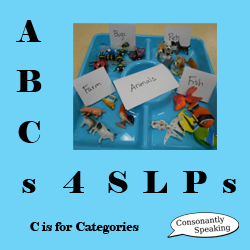 Have each section labeled with a category and have children place small objects in the corresponding categorized sections. An image of this activity is seen above and you can read more on this post. 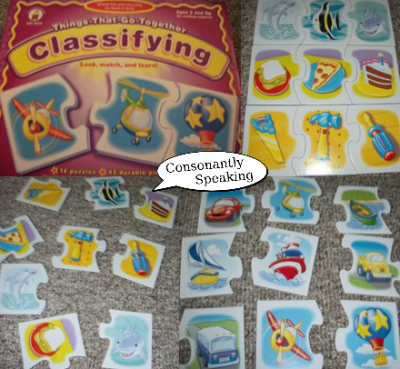 One great product that I found for younger children is a Things That Go Together Classifying puzzle. The puzzle includes three pieces per category that fit together. Some categories include tools, vehicles that fly, food, and zoo animals. There are many different puzzles on the market that have to do with categories, and this is just one of them! 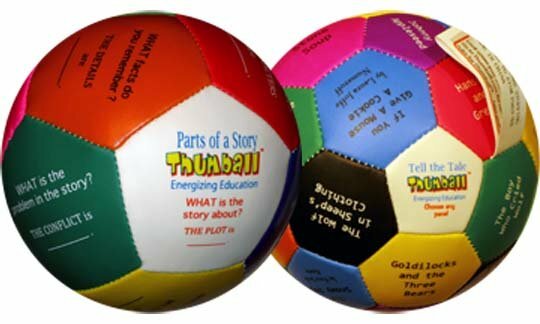 Another great product that many speech-language pathologists have used for categorization skills is the Thumball. Thumballs come in many different types including letters, feelings, categories, parts of a story, conversation, and action words. Thumballs look like soccer balls and have words or images written on the different hexagons. When rolled or thrown, whatever a person's finger lands on is the task they must do (such as state a part of a story, ask a question, etc.). Many people have created their own versions of Thumballs on different blogs. 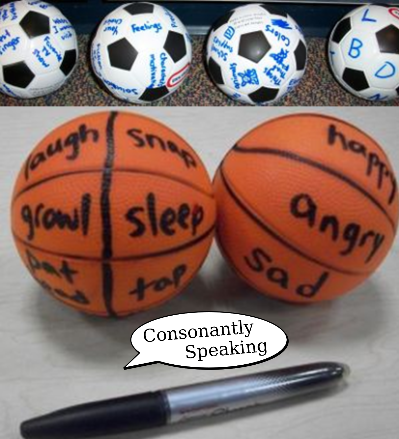 Take a soccer ball (you can get a small one for between $2 and $5 depending on where you get it) and use permanent marker to write different words/draw pictures on the soccer ball. You can also use flash cards, worksheets, or board games to work on categories. 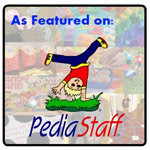 Super Duper Publications, Linguisystems, and Lakeshore Learning all have some great products and worksheets involving categories. Other websites that have printables based on categories include Education.com, Speech Room News (here and here), and Speech Time Fun (here and here). 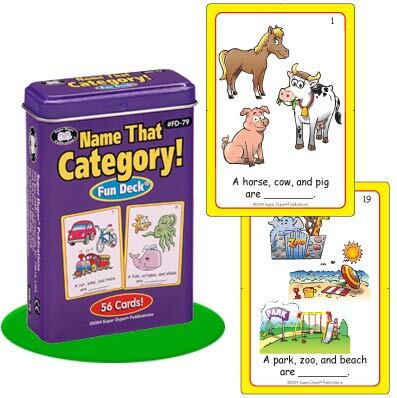 Categories Learning Center, Category Carousel, Name That Category Fun Deck, Let's Name Things Fun Deck, What Doesn't Belong? Fun Deck, SimpleSort, SimpleSort: Continents, SimpleSort: Counting, Clean Up: Category Sorting, NLConcepts Autism: Sort & Categorize, Sort it Out!, Autism & PDD Categories, Pre-Number Category Sorting Matching Game, Sort it Out 1, Sort it Out 2, Look Again Jr., Memory Game - Categories, Sort It! Kids, ClearUPThings, ClearUPThings Fruits & Vegetables, ClearUPThings Shapes HD, ClearUPThings Vehicles HD, ClearUPThings Animals HD, ClearUPThings at the Kitchen HD, ClearUPThings Daily Essentials HD, ClearUPThings in the Living Room HD, ClearUPThings Properties HD, ClearUPThings in the Country, ClearUPThings Foods HD, Where Do I Go? Group & Match Words, Sort It! Animals, TeddyMix 1, Categorization HD, and Timmy's Toy Sort. Grab some toys and start sorting!